Learn to identify this pest with these helpful pictures.. Size: Multicolored Asian lady beetles are about 7 mm long. Color: As the name indicates, they occur in a wide spectrum of colors ranging from yellow to orange to red and have a varying number of spots. Characteristics: The variability of appearance in the adults can mislead people to think they are different species. A characteristic that assists in their identification is an “M” shaped mark located behind the head. How Did I Get Asian Lady Beetles? 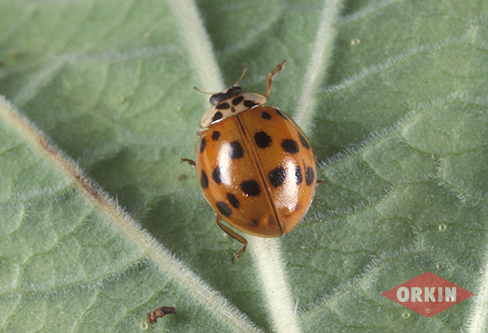 Outdoors, Asian lady beetles helpfully feed on plant pests like aphids and many others. From September to November, they move indoors to overwinter, crawling along windows and walls. Small cracks around windows and door frames provide entry points. While indoors, the pests search for moisture or humidity and bask in warm portions of the building when possible. Houses near woods or fields are prone to infestation, although any building can attract the pests. Contrasting shades of light and dark, like blacks against a white background also attract Asian lady beetles. How Serious Are Asian Lady Beetles? These beetles are nuisances simply because of their large numbers. Few natural enemies exist to thin their numbers, and multiple generations of the pest are born per year. The pests also carry an unpleasant odor that grows more intense when they are smashed. Crushed Asian lady beetles leave behind a yellowish fluid that can stain walls and clothing. These factors make infestations hard to control. Are They Harmful to Plants? It depends on the Asian lady beetle species. Some species are predacious on other insects, which benefits plants, and others are plant feeders that typically damage agricultural crop plants. Identifying plant feeding lady beetles is simplified if a specimen is collected in the process of feeding and the person who identifies the insect knows what kind of plant the beetle was feeding on when it was captured. The most troubling sign of multicolored Asian lady beetles is the appearance of large numbers of adults on and around buildings. This occurs during the fall with renewed activity on warm winter days and again in the spring. The larvae may be seen on plants or outdoor surfaces, but due to their radically different appearance from the adults, may not be recognized. More on lady bug infestations. Seal gaps and cracks where lady beetles may enter the structure. Pay close attention to areas such as siding, doors, windows, chimneys, ridge, soffit, and gable vents and openings around pipes, conduit, and utility wires. Repair or replace damaged window or door screens. The first thing to do when dealing with ladybug beetles is to contact your pest management professional (PMP) and request an inspection. Your PMP will correctly identify the pest insect(s) and provide a plan for dealing with the problem. Use a HEPA filter vacuum. Be sure to empty the vacuum bag after using it. Use a broom, sweep the insects into a dustpan or other container, and put them outdoors. Use insect light traps in locations that stay relatively dark and attractive to ladybug beetles such as attics. Your local Orkin technician is trained to help manage Asian lady beetles and similar pests. Since every building or home is different, your Orkin technician will design a unique program for your situation. For instance, your PMP may apply insecticides at the right time of the year to control the pests before they get inside your home. Orkin can provide the right solution to keep Asian lady beetles in their place…out of your home, or business. Multicolored Asian lady beetles are common throughout most of the United States and parts of Canada. There are many specie, and most are beneficial insects. Plant specialists imported several species of lady beetles into the United States to control crop pests. Asian lady beetles are true beetles in the beetle family Coccinellidae. While they are commonly called ladybugs or ladybirds, pest management professionals generally prefer to call them ladybug beetles or ladybird beetles. There are about 5,000 species of Asian lady beetles worldwide, so depending on the species and habitat, there is a large variation in this insect’s life cycle. For example, some lady beetles are predators, while others are plant feeders. 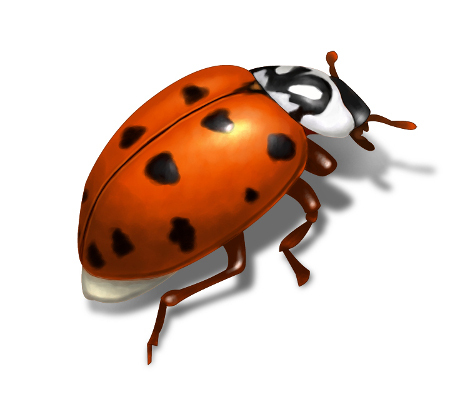 However, all lady beetles undergo complete metamorphosis – four distinct life stages. Females lay eggs in clusters on the underside of a plant leaf or twig. Generally, the female will choose a plant that is infested with their prey – aphids or scales. Eggs are laid during the spring and early summer. One fertile female can produce up to 1,000 eggs, and eggs hatch in about five days. Larvae have been described as looking like very tiny alligators. If predators, the larvae feed upon their prey insects and may often consume some of the un-hatched eggs if prey is scarce. The larvae go through four instars, molting and becoming larger at each instar stage. The larval stage takes about 1-2 weeks to complete. This is the insect’s resting stage when it goes through the transformation into an adult. Depending on the species and the environmental conditions, the pupal stage lasts about 3-12 days. Newly emerged adults feed on the same prey as the larvae and remain active until the weather turns cold when they seek protected overwintering sites. Depending on the species and location, Asian lady beetles produce from one to several generations per year. These pests take around one month to grow from egg to adult and can live for as long as about three years.